Nissan celebrated the end of an action packed racing weekend at the Simola Hill Climb in Knysna with five GT-Rs qualifying in the top 10 for the King of the Hill competition and first place in the Supercar Class for its factory backed GT-R R35. The top step on the podium in the Supercar class belonged to Jaki Scheckter, who led this division from practice on day one and who showed a clear set of tailpipes to the Italian and German supercars in this class. "I really loved racing the GT-R," says Scheckter. "It performed faultlessly throughout the two days of racing and I managed to cut my times with almost every run." Scheckter won the class with a final time of 43.591 in his R35 GT-R, which was supported by Nissan South Africa and prepared by BB Nissan. The best performing GT-R on racing day in the King of the Hill competition was the beastly 1 800 horsepower R32 GT-R of Des Gudzeit. Des won last year's event and came second this year behind the custom-built open top racer of Franco Scribante. The Dezzy R32 set a blistering time of 40.324 second for second place on the King of the Hill podium. The fourth place in this prestigious event went to Wilhelm Baard, global test engineer for Nissan. Baard piloted a Nissan GT-R which was upgraded to deliver approximately 1 000 kW by the team from BB Nissan in Pretoria with backing from Nissan South Africa. It was a rough and tumble weekend for Baard, who was sidelined on Saturday with a misreading gearbox sensor. After the team found and corrected the issue Baard was only left with the few test runs on Sunday-morning to test the vehicle set-up and build his racing confidence. "We did not have many runs to fine-tune the GT-R's set-up, which is infinitely customisable. This morning we changed the vehicle's rake to allow for greater downforce at high speed at the top of the course," says Baard, who ended the day with a time of 42.745 s for the 1.9 km course. Other GT-Rs that competed for the King of the Hill title was an R32 GT-R driven by Duane Galloway, which finished in fifth, and a modified R35 GT-R of Edrich Zwiers, which was sixth fastest. Zwiers partnered with NxGen to upgrade his GT-R with a full race exhaust from HKS, an Alpha 6 upgrade kit, Cabb intakes and a flexi fuel system which allowed it to race on ethanol. With these and other conversions the GT-R #35 delivered 670 horsepower and recorded a final time of 43.894 s on its last run. "The engine and turbos are left standard and in preparation for the hill climb we raced at Phakisa, Midvaal, Zwartkops and Kyalami. This GT-R has done over 500 laps in the last few months without a fault, before pulling up to the start at Simola and competing for King of the Hill," says Zwiers. The weekend saw no less than 11 GT-Rs compete at Simola, covering a range of model years and varying stages of tune. The competitors included the top-performing GT-R R32 of Des Gutzeit, a Nismo-tuned R35, a pristine GT-R R34 V-Spec with 680 horsepower and a completely standard R35 with road tyres, running on 95 octane fuel. 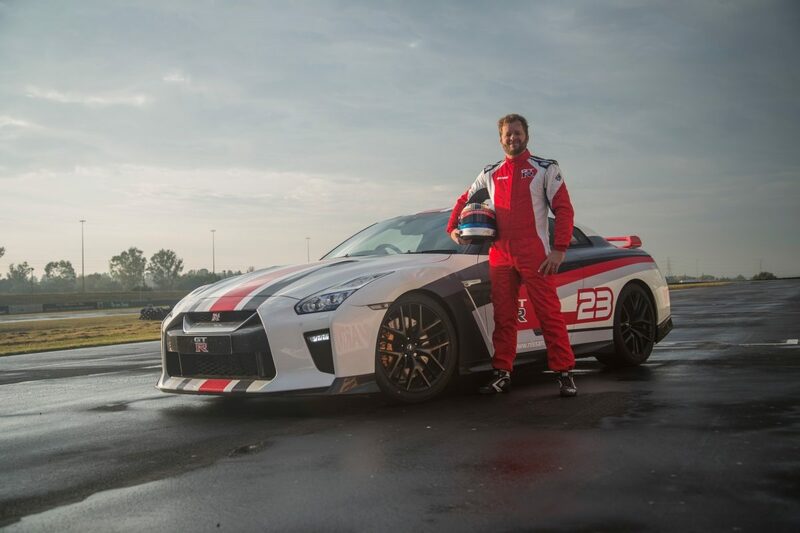 Piloting the standard R35 was Ignus Geyer, a car enthusiast from Johannesburg who drove his Nissan GT-R down before the weekend, filled it up at the local fuel station before racing started and who will be heading back to Jozi tomorrow. Geyer ended the day in the fifth position in the Supercar class. "The only modification I made was to increase tyre pressure by 0,1 bar," says Geyer, who clocked half of the vehicle's 9 000 km on race tracks across the country. "I cannot get enough of this car, it is a comfortable everyday drive and a peerless performer on the track." "I kept saying to myself that I could take another second off my qualifying time in the final run of the Supercar competition and come within 2 seconds of the much more powerful converted GT-Rs," says Geyer, who ended in fifth place in the Supercar Class with a time of 47.665, after clocking a time of 48.735s during the morning practice runs. "It is incredible to see the passion surrounding the GT-R brand. Those competing in the various GT-R models trust their car's performance unconditionally and other competitors have a healthy respect for the GT-R and its capabilities," says Xavier Gobille, Director for Sales, Marketing and Aftersales at Nissan South Africa. Gobille confirmed that the new GT-R, which was launched at the New York Auto Show in March this year, will be available in South Africa in September. The first shipment has already been sold out. Nissan South Africa is the operational hub for Regional Business Unit South, serving Nissan's key South Africa market and 45 other countries in Sub Saharan Africa, including Angola, Ghana, Kenya and Nigeria as well as the key Southern African markets of Botswana, Namibia, Lesotho and Swaziland. In South Africa, the company offers a range of 24 vehicles under the Nissan, Infiniti and Datsun brands, including the popular locally-produced Nissan light commercial vehicles - the NP200 half ton pickup and NP300 one-ton Hardbody - produced at the company's Rosslyn plant, north west of Pretoria. Nissan made history locally in 2013 with the introduction of Africa's first electric vehicle, Nissan's flagship Nissan LEAF. As well as boasting zero emissions leadership, Nissan is also a leader in the crossover segment. Among its product offerings are the all-new Nissan Qashqai and X-Trail, as well as Juke. The Datsun brand has re-established Nissan in the entry-level market where the tailor-made Datsun GO is breaking new ground in the 'riser' market segment. Infiniti continues to make a mark in the luxury segment. Nissan is one of the top five automotive companies in South Africa.